Continental Specialties Delicatessen and Cafe, commonly known as The Dutch Store in Barrie, is both a store and cafe located at 126 Dunlop St. in downtown Barrie. It's owned and operated by Pamela Field. The store opened initially on Mary Street in 1964, and 1995 moved to its current location on Dunlop Street. The store has always been a family-run business, and Pamela's four sons have all worked in the store or at the warehouse, which supplies not only Continental Specialties but also other Dutch stores across Eastern Canada. 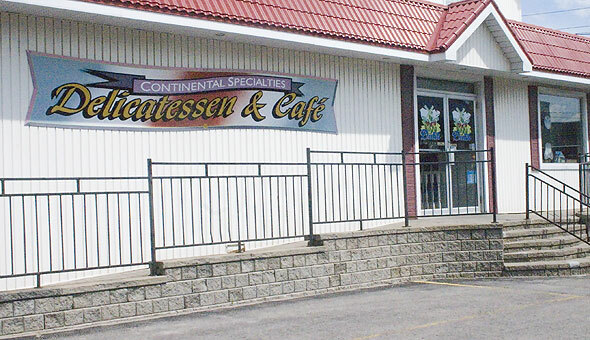 The Continental Specialties Delicatessen Café has been in existence for over 50 years, providing quality customer service and lots of unique dishes to visitors who have graced its tables. A grocery store comprising of different varieties of groceries from Holland is also available at the Continental Specialties Delicatessen. Dining at the Café would provide you with tables well-arranged in European style and lots of delicacies to ensure you get a suitable dining experience from the café. The Delicatessen offers smoked and dried sausages, Dutch salami, black forest ham and lots of other Dutch delicacies. A few German, British and Portuguese products are available on the website. Cheese lovers are not left out of the package offered at the continental store, few varieties of cheese such as Spiced Gouda, Jarlsberg, Proosdji and lots of other products can be found in the store.